Collaborate 2016 is a just few days away. IT Convergence’s Chief Technology Officer, Gustavo Gonzalez, will be presenting on several topics during the conference. 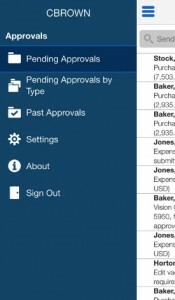 Today, we’ll take a sneak peek at one of these topics: EBS Oracle 12.2 Mobile Apps. Take Your Financial Reporting System to the Next Level! Next Generation Cloud Backup: Everything you need to Know! Last week we held our webcast: "Next Generation Cloud Backup: Everything you need to Know!" and our experts answered a few questions live. Today, we bring you the transcript and the chance to download the recording and presentation. QA for Why Is Open Source the Smartest Choice for Hybrid Integration? Yesterday we had our webcast: "Why Is Open Source the Smartest Choice for Hybrid Integration?" and our experts answered a few questions live. Today we bring you the transcript and the chance to download the recording and presentation. Recently we had our webcast: “Kick Starting Your Rollout Project in Latin America”, and our experts took some questions from our audience. Are you leveraging SQL Server through PaaS?